Ahh, Monday morning – it’s so much easier to feel ready for the week after a restorative three-day weekend. Love those long weekends! It was indeed a relaxing one (hopefully for you, too). The Will Bake for Food bake sale took place on Saturday and was a marvelous success - we raised $2571 and filled a few barrels with food donations. I also met some terrific bakers/bloggers and ate way too many amazing treats (homemade Twinkies, toffee, chocolate meringues, monster cookies, chai spiced snickerdoodles ... I was quite impressed by the array of creative baked goods). The rest of the weekend was spent reading, watching movies, sleeping, cooking and eating. Since it was alternating between hail and rain outside, these were perfect indoor pursuits. My weekend cooking veered dramatically away from sweets. I’ve been baking and sharing a lot of desserts this past week and I need a bit of a sugar detox. Time for something more virtuous, but not too virtuous. 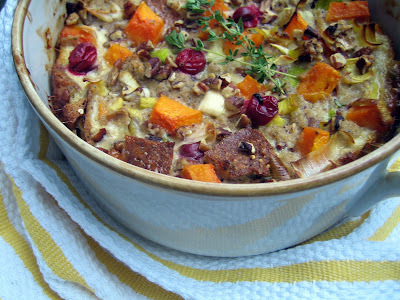 Bread pudding is a long-time love of mine and I got to thinking about a savory version. With Thanksgiving approaching, I have tastes such as cranberries and squash on my mind. In my opinion, stuffing is the best part of Thanksgiving dinner (and pumpkin pie ... but we’re not talking about sweets today). 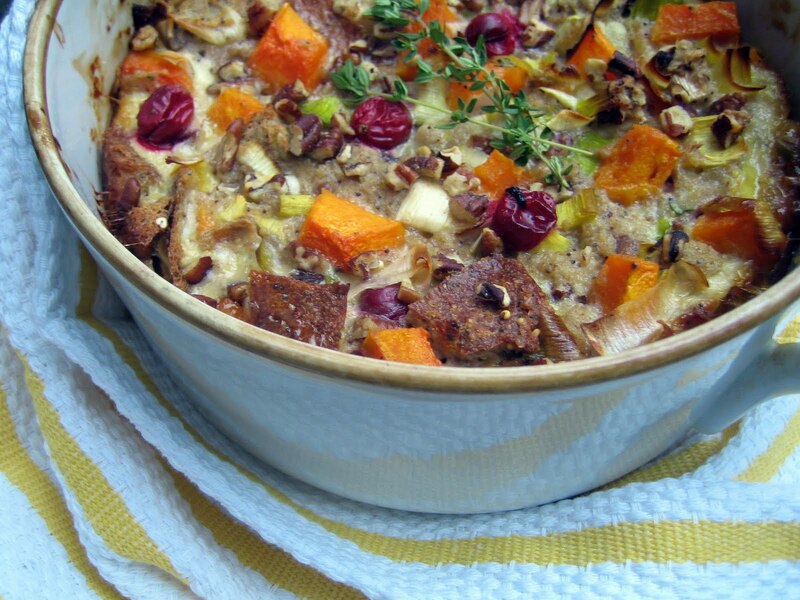 Don’t limit this bread pudding to dinner, though. I would also serve it for brunch with oven scrambled eggs and grapefruit mimosas. 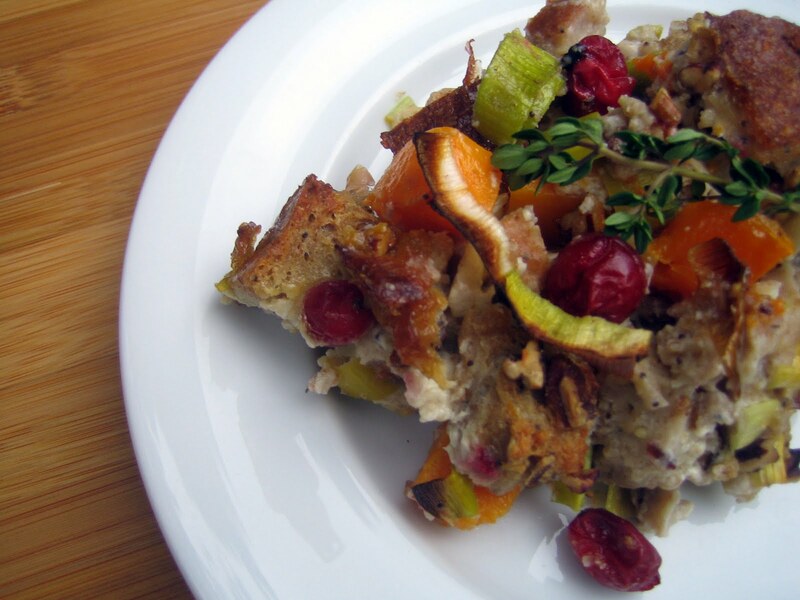 Have fun playing around with the ingredients and add your favorite stuffing flavors. Preheat oven to 375 degrees. Butter a 2 1/2 - 3 quart casserole. On a rimmed baking sheet, toss the butternut squash and leeks with a few drizzles of olive oil. Spread evenly and roast for about 25 minutes. The squash should be softened but still a bit firm and the leeks should have some brown, crisp edges. In a large mixing bowl, whisk together the eggs, milk, maple syrup, thyme leaves, salt and pepper. Add the bread, stir well, and let it soak while the squash and leeks are roasting. Scrape the squash and leeks into the bread mixture, then add the cranberries. Stir gently. Dollop the goat cheese in (you want to keep some small chunks) and most of the pecans and stir gently again. Pour the mixture into the prepared casserole. Scatter the remaining pecans on top. Bake until golden and set, about 55-60 minutes. Serve warm. Oh my. This looks wonderful! I love stuffing, too. Like to an obsession. But I only make it once a year on Thanksgiving. This, I could make tonight! Thank you, B! I only make stuffing once a year, too, for Thanksgiving. But I make enough to have lots of leftovers! Thank you, Katherine! Are you planning to cook a Thanksgiving dinner in Be'er Sheva? Gorgeous!!!!!!! It looks like you guys had so much fun at your Food52 potluck! Hi Emma - yes, this could be a lovely veg stuffing option. 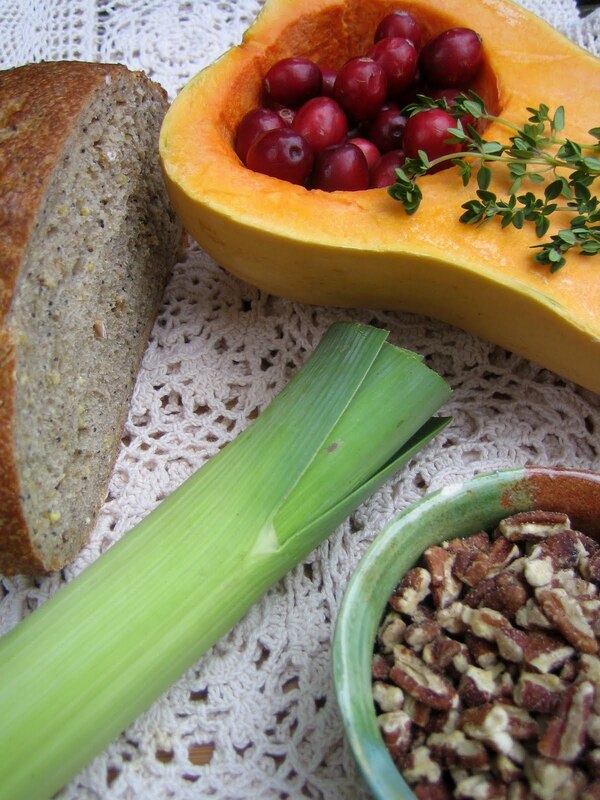 The vegetarian side dishes are always my favorite Thanksgiving choices! This is making me feel a little sad about my lunch--I would much rather be eating Butternut Squash and Leek Bread Pudding!